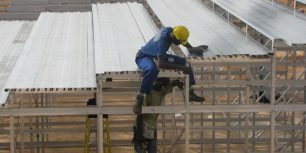 Once on site in Togo, Africa, we had the opportunity to train and work alongside of the local labors that were provided by another one of the local General Contractors. The local help was very eager to help, and they were quick learners. Project for a government event in Togo, Africa as they celebrated their 50th year of independence from France. 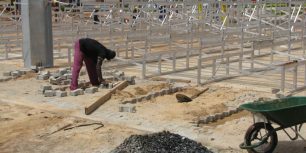 The local laborers in Togo, Africa were provided by one of the local general contractors. They were very eager to help and were quick learners. 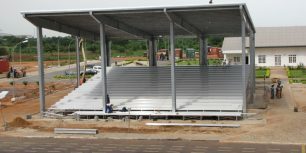 In Togo, Africa, we had the privilege to work with a local company, BAK Transaction LLC, led by Mr. Amah. 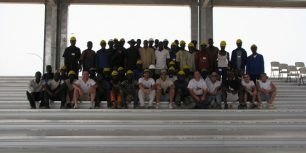 It took us 23 days to complete the project once we arrived in Togo. 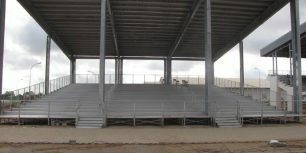 These two buildings, complete with a full set of aluminum bleachers, were constructed for the 50th year celebration of independence for Togo, Africa. 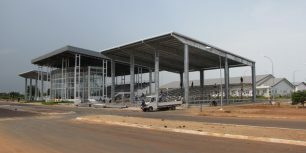 The two canopies were built to provide seating and shade for the President’s special invited guests at Togo, Africa’s 50th year celebration of independence.